The silver that the gauge cluster bezels, AC vents, radio, window switches, and center console insert trims on 2003-2005 E85s are painted is called Titan Shadow by BMW. This color was also used in the E46 M3 interior, for the SMG shifter surround, SMG paddles, steering wheel trim, and as an interior trim color. Over time, age and weathering takes its toll. Where does one find a perfectly-matched, yet durable paint to restore the trims? I've found a perfect, and I mean PERFECT match of vinyl to this color. 3M 1080 Matte Charcoal Metallic. I also did the center console trim, and you can see the original paint of the airbag light trim/ring, compared to the vinyl around it. Hi and welcome to the forum. That trim has taken a hell of a beating - what millage was the car? 110k miles. Interior was pretty trashed, for the (to-me) relatively low miles, in part because of the car being a sun-baked Florida car. I swapped it from beige to black, carpet and all, with E46 3-series sports seats, and redid the center console in Alcantara, with the dash trims in Alcantara as well, and wrapped the old center console trim in this Titan Shadow color. Looks like someone was moving stones in it! My interior is really coming together. A little dirty though. Need new shift boots and to rewrap the steering wheel in perforated leather. I've found a perfect, and I mean PERFECT match of vinyl to this color. 3M 1080 Matte Charcoal Metallic. Thanks for this info! A previous owner stuck a horrible massive M Sport sticker on my ash tray lid. Removing it left superglue etc on the surface. 3M vinyl now en route from France for me to test your recommendation! 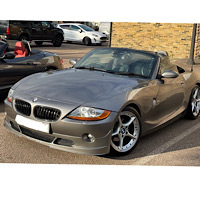 2003 3.0i E85 Z4 Roadster in Sterling Grey | E46 M3 seats | Gaptech | Stubby and proud! Wow, that looks a perfect match . I think I will have to order some of that vinyl for my interior. Was is difficult to do?